The round skylight is also known as Snell's circle: A cone of light of width of about 97 degrees. How Does a Trout Catch a Fly? : Marinaro's "Edge of the Window Theory"
Anglers often ask "What fly will catch a trout?". This page turns that question on its head and explores how a trout recognizes and intercepts a fly drifting towards it on the surface of the water. The answer gives an insight into how to design effective trout flies and why our artificial flies are sometimes ignored by feeding trout. Trout see the world through a skylight - or circular 'window' - surrounded by mirrors. Marinaro's great insight was to recognise how trout use the position of the fly in this window to make an effective rise. This diagram sets the scene for our exploration of a deceptively simple question "How does a trout catch a fly?". The trout's problem is similar to ours when we try to catch a cricket ball. It looks easy until you try to do it. Traditionally angling writers have talked in terms of deceiving a trout into taking an artificial fly. I want to put a slightly different slant on the angler's task. I want to work with the trout rather than trying to deceive it. After all, fish want to eat. If we understand how a fish catches an insect we can present our fly to make it easy for the trout to consume it. The angler's problem is to design and present a fly so that it can be easily caught by the trout. Our local west country rivers are relatively shallow. 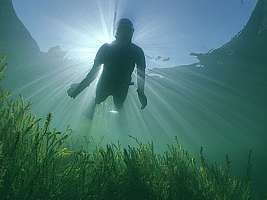 Trout often lie close to the surface. This diagram shows that a trout lying one foot beneath the surface has a very small window above its head - 11 inches in radius. We are trying to present our artificial fly into a very small area. We often judge where to cast our fly by noting where a trout rises to take a natural fly. But there is a flaw in this approach which has been explained by Vince Marinaro (1995). In this groundbreaking book - first published in 1976 - Vince Marinaro described how trout moved to intercept insects drifting towards them. He called this sequence the 'simple rise'. He observed that trout drift downstream and tilt their head upwards as they position themselves to take a fly off the surface. In other words, the position of the rise may not correspond to the trout's 'observation post'. The rise may occur some distance downstream of the holding lie. After taking the fly the trout returns upstream of where the rise is seen by the angler. The implication of this important point was elegantly captured in a drawing by Dermot Wilson (1957). If you have read this far, you may have formed the impression that to have any hope of catching a trout you must cast your fly into a circle with the diameter of a dinner plate, located some indeterminate distance upstream of where you saw a fish rise. Don't worry, if that were true no one would ever catch a rising trout, and - more importantly - most trout would starve to death ! It turns out that trout get 'advanced warning' of a fly long before it appears in their 'window'. Up to now we have concentrated on the trout's 'window'. But we must also consider the 'mirror' which plays an equally important role in the trout's view of the world. Remember the description: "The trout lives, as it were, in a room with a ceiling made of mirrors except for a round skylight in the middle (the window) , through which the outside world is visible" Frost and Brown's (1967). 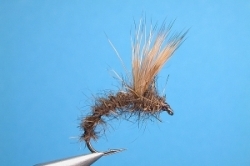 Trout are able to see parts of an insect or artificial fly that rest on - or puncture - this 'mirror'. The bodies of emerging flies break through the water surface. They hang beneath the mirror. The legs of duns rest on the surface. Therefore parts of an insect are visible to fish long before the insect has entered the trout's window. John Goddard has calculated that trout are able to employ binocular vision to detect approaching insects in a band of water that is about 30 inches wide (see Roberts, 1994, p 15). 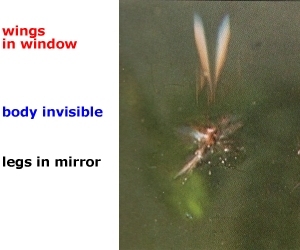 In addition, Marinaro (1995) and Hewitt (1948) as well as Clark and Goddard (1980) have provided photographic evidence that trout could see the wings of approaching insects in their window. 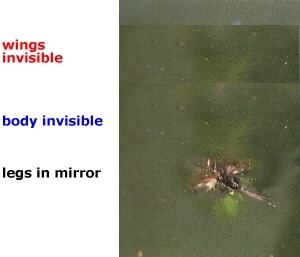 Clark and Goddard explain that because of the refraction (bending) of light rays entering water, parts of an insect that protrude above an angle of greater than 10 degrees to the water surface are potentially visible in the window. 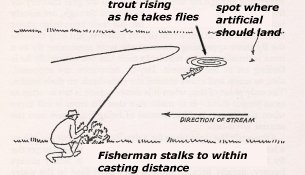 The next diagram shows what part of an insect are visible as it drift downstream towards a waiting trout. The next series of diagrams examines the three points 1, 2 and 3 in greater detail. 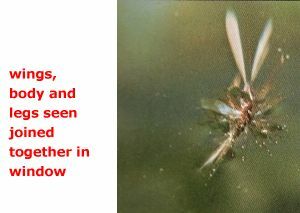 The diagrams incorporate actual photographs taken by Clark and Goddard which show how the wings and body of the insect gradually merge as they get closer and closer to the edge of trout's window. These photographs are important. They suggest a way in which the trout can guage the position of the fly whilst rising to consume it. And they contain important hints for the design of effective artificial trout flies. It may help to understand the significance of these visual cues to a trout by comparing them to how we react to visual cues at a set of traffic lights. We react to traffic lights automatically. We don't have to consciously think about what to do with our legs and arms to control the car's brakes and clutch. It's just the same for trout. They automatically adjust the position and orientation of their body to meet the insect as it is carried towards them by the current. in case I need to stop" "I see insect legs approaching. water surface to intercept it"
put gears in neutral" "I see legs and wings. hand brake" "This is food. Clark and Goddard (1980) consider that penetration of the mirror by an insect's feet act as the 'primary trigger' for the trout's rise. They wrote: "It is these star-bursts of light created by the indentations of the feet of the dun floating on the surface, that are the first trigger to the trout's pedatory mechanism." 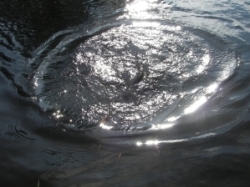 Under normal circumstances an insect's wings do not penetrate the water surface. Because of the laws of refraction, fish cannot see any part of an insect which lies below an angle of 10 degrees to the water surface. Therefore, wings only become visible when the insect is very close to the edge of a trout's window. For example, the table below shows that the wing tips of an insect with wings that are half an inch high will only be visible to a trout when the insect is just over two and a half inches upstream of the edge of the trout's window. These calculations support Clark and Goddard's claim that an insect's wings are not responsible for triggering the onset of a trout's ascent in the water to intercept an insect being carried downstream towards it. Wings appear too late for the trout to use them to trigger an effective rise. However wings are important. Wings maintain the trout's attention on the fly as the fish rises towards the surface to intercept the fly. Marinaro's and Clark and Goddard's photographs show that when an insect reaches the edge of the trout's window, a crucial event takes place. The wings, body and legs of the insect merge together. "Why does the trout keep the fly at the edge of the window?" Trout behave in this way in order to judge the exact position of the fly. By keeping the fly in a precise position relative to its body, the trout stands a very good chance of engulfing the insect. I'm not for one moment suggesting that trout do mathematical calculation. But I am suggesting that the trout's behaviour has evolved in response to the physical laws which describe its everyday environment. 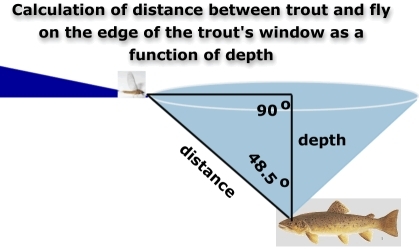 Alternatively the trout may learn to capture prey by using this "edge of the window effect". The trout stands a very good chance of successfully ingesting the fly if they drift downstream keeping the insect on the edge of the window. The acquisition of this skill may involve learning, maturation and practice. The next diagrams show how Marinaro's theory can also account for how a trout intercepts a natural or artificial fly swimming beneath the surface. By keeping the fly on the edge of the window, the trout stands a very good chance of engulfing the insect. 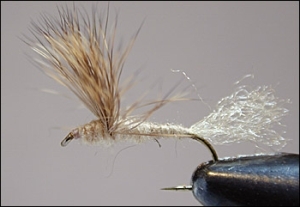 These important features are captured in flies such as Hans van Klinken's Klinkhamer, Roman Moser's Balloon Caddis, Craig Mathews' Sparkle Dun and Bob Wyat's Deer Hair Emerger which are effective on west country rivers. 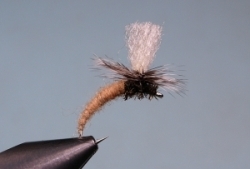 What other factors are important in the design and presentation of trout flies? Datus Proper (1993) presents a strong argument that these are perfectly reasonable criteria for designing an effective artificial trout fly. Common sense tells us that these factors are important. Consider our cricketer trying to catch a ball. We wouldn't be surprised if a cricketer made very little effort to catch a square grapefruit when he is expecting to intercept a round, red cricket ball ! "Many books by competent writers and fishermen ... conclude that a dragging fly frightens the trout. I do not agree with that at all." I have to agree with Wyatt and Marinaro. The simplest explanation is that drag makes it difficult or impossible for the fish to maintain the fly at the edge of the window. Of course there are circumstances where fish will take a dragged fly. But in those situations the trout's rise is triggered by the fly's wake. The trout probably keeps the wake at the edge of its window. Why are artificial flies sometimes ignored by feeding trout? Angling writers tend to focus on success and successful flies. Much less attention has been paid to why a trout sometimes misses or ignores a fly. Most of us have experienced occasions when a trout rises to an artificial fly but fails to ingest it. Various excuses are offered; the trout is said to be 'rising short', or we blame ourselves for not striking soon enough. But maybe the trout has simply misjudged the position of our fly on the surface, or micro-drag on the leader has taken the fly out of the window. 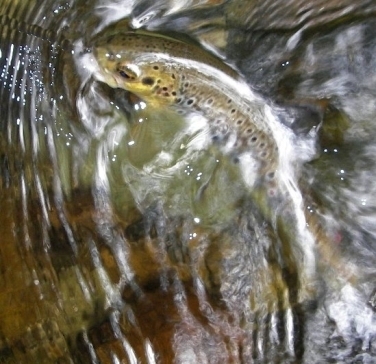 Young trout on fast moving water seem especially prone to these 'mistakes'. In contrast, older and bigger trout - especially on small stillwaters - rarely miss the fly. 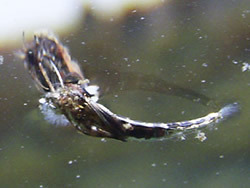 Juvenile fish may need to practice the skill of taking a fly from the surface. Wells (1958) found that young cuttlefish needed to practice catching their prey. If you have nothing better to do you can read my article on the role of maturation and practice in the development of apparently instinctive (unlearned) behaviours. Many fishing books concentrate on ephemeroptera - the upwinged flies. Frankly it is rare to see the duns of upwinged flies floating down our rivers in vast numbers. On Dartmoor and South Devon rivers, large upwinged flies are vastly outnumbered by millions of little black flies "no-see-ums": for example black gnats and glossosoma caddis. These flies are very small. They are very difficult for us to see on the water. It sometimes helps to squat down and look across the water surface. Small insects do not present a large footprint in the trout's mirror. Also they have small wings which give a very indistinct target in the window. When trout are feeding on small flies they seem to lie very close to the surface. As we saw above the window is very small in diameter when the trout is close to the surface. Therefore it is important to try to present the fly very close to the fish. But as we have seen it can be misleading to assume that a fish is lying where a rise is spotted. Maybe that's why small flies are called the "Anglers' Curse". I don't have an easy solution to this problem. The best I can do is to make repeated casts in the hope of getting my artificial noticed. Clark, B. and J. Goddard (1980). The Trout and the Fly. London, Ernest Benn Ltd.
Hewitt, E.R. (1948). A Trout and Salmon Fisherman for Seventy-Five Years. London, Scribner. Marinaro, V.C. (1995). In the Ring of the Rise. Shrewsbury, Swan Hill Press. Proper, D. (1993). 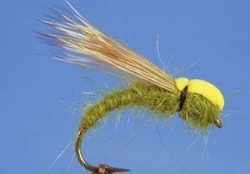 What the Trout Said: About the Design of Trout Flies and Other Mysteries. Shrewsbury, Swan Hill Press. Roberts, J. (1994). To Rise a Trout. Marlborough, The Crowood Press. Wells, M.J. (1958). Factors affecting reactions to Mysis by newly hatched Sepia. Behaviour. 13:96-111. Wilson, D. (1957). Fishing the Dry Fly. London, Adam and Charles Black.